Evolution has had the choice to create many different events throughout the 2.7 billion years that life has existed on this planet. Many paths have been created and avoided. Take the fact that mammals could have been the main form of life throughout the mesozoic instead of Dinosaurs. A bit closer to our time throughout the Cenozoic a strange parallel occurred between the two continents Australia and South America. These countries had split early in the cenozoic in the Eocene. With this in mind the evolutionary event became more incredible as both countries were completely isolated not only from each other but the rest of the world before the Cenozoic. This leaves us with a question. How and Why did this parallel occur. The most important part of this analysis is understanding what exactly the parallel is. Many aspects of both countries were similar over this large time period however they are currently very dissimilar. The most notable similarity throughout these two continents in the Cenozoic was the Fauna. The Fauna and food chains of both of these continents were extremely similar down to a very fine point. At the top of the food chain both countries had large flightless birds. While these birds were taxonomically opposite they both served roles as the major carnivores of the ecosystems. Australia had the Dromornithids which were large carnivorous Anseriformes (waterfowl). Dromornithids ranged in size from that of a cassowary to possibly being the largest bird to have ever lived. South America on the other hand had Phorusrachids which were carnivorous Cariamids. This in mind not all Phorusrachids were large in size and most in fact were quite small. However the large Phorusrachids rivalled the Dromornithids in size. These large carnivorous birds are one of the easier to understand examples of the parallel. During the Early Eocene period after the extinction of the Dinosaurs flightless birds appeared to have become the major predators around the world taking the dinosaurs place. However the further into the Eocene we get the birds appear to have died out. This is mostly believed to be due to a change in the dense forest climate allowing larger mammals to evolve and take their place as the major animal group in the world. It is believed that the birds had evolved to adapt to the climate change as it was a much slower process in the southern hemisphere. This allowed the birds to survive this change and keep evolving into the miocene and pliocene. Other faunal similarities between the two continents include mammals. The mammals in both of these continents were similar and can call upon effective symmetry. For example both continents had catlike marsupial predators with interesting dentition. 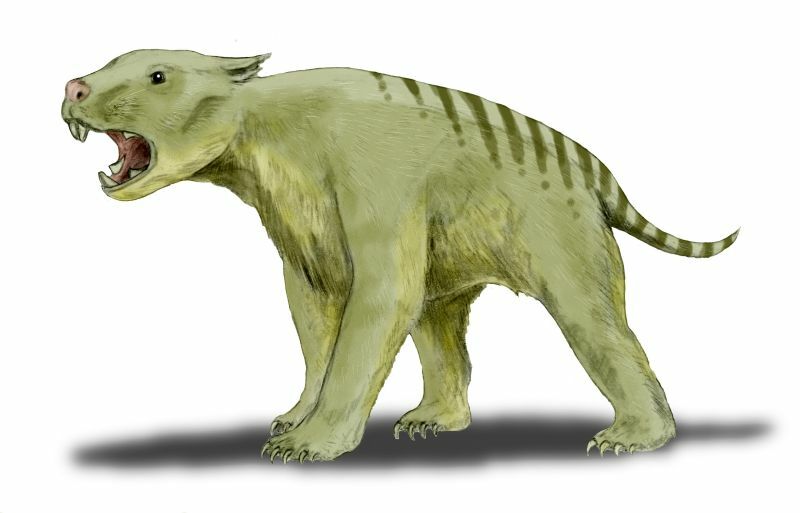 The Thylacoleonids which were Australian and had large pronounced incisors which are believed to have replaced the canines that a placental carnivore would have. The Thylacosmilids which had large saber like teeth which differed from the sabre-toothed cats elsewhere in the world due to sheaths that the Thylacosmilds had on their lower jaw. Both of these marsupials shared similarities in that they both seemed well adapted for climbing and both had large powerful arms. The large herbivores were also similar in size with both countries having large slow herbivores that relied on size to protect themselves: the Diprotodontids and Toxodontids. Both also had smaller but still large faster prey for example the larger macropods (Procoptodon) and Machrauchenids. We can gather from this is that the parallel may have been due to an extremely similar climate. This is highly likely as both countries were on very similar latitudes and before the Ice age this likely would have meant very similar climates. In fact if we are to look at the morphology of the fauna in both continents we see very similar molar structure which may mean that the flora of the time periods of both countries was very similar. This creates an inference that the climate would have been similar. With a similar climate both continents are able to support extremely similar ecosystems. This combined with the connection of Australia and South America throughout much of the mesozoic including the development stages of both mammals and birds creates a believable situation to which these continents supported such parallel ecosystems for such a large period of time. While this answers one question it leads to another. Why are the climates of both countries so different during the Holocene? The “Ice Age” may provide an answer to this. During the Ice “Age” many climatic fluctuations occurred where glaciers constantly moved in and out in the Northern Hemisphere. These glacial movements caused many climate issues in the Southern Hemisphere. With the ocean levels dropping water moved further away from the centre of Australia , possibly even drying up rivers. This may have created what is now known as the “Red Centre” of Australia. With the Australian centre so arid for such a long period of time it would have made the ground extremely dry when combined with the lack of trees water would have trouble being able to remain in the soil to help saturate any tree growth creating an infinite loop of dry. Meanwhile in South America the opposite was happening and the scrub forests that covered the continent were now starting to become lush due to it’s connection with North America which was having Glacial Movements. The soil would start to dampen and while plant growth would be hard during the Ice Age by the start of the Holocene the soil would have been rich enough to support the large rainforests we associate with South America. The climate change in the Ice Age also brought about the death of the previously mentioned fauna which were either not able to adapt to the changes or killed off by humans who had travelled to the continents due to the change brought by the Ice Age. Over 2.7 billion years of evolution have brought us here. Unfortunately we have missed out on so many wonders. It is amazing to think that one geological event could have changed to continents so similar into completely different continents. Continents so different that they created El Nino and La Nina.